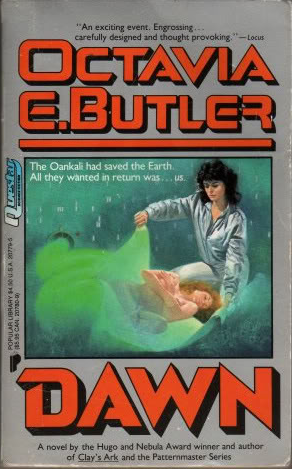 Dawn by Octavia E. Butler was chosen as the July book pick for the Sword & Laser book club. I’d never read any of her works before, but I’d heard good things, so I was excited. I’m happy to say that this story did not disappoint. Can we talk about this cover for a minute? described in the book, we can’t even get the characters right? a strong, smart black woman. That is all. Dawn is the first book in the Xenogenesis Trilogy. Humanity has nearly destroyed itself and the Earth, with the remaining survivors placed in suspended animation by the Oankali. The main character in this story is Lilith, a woman who is awaked by the alien race and chosen to be the leader who will help humanity re-colonize the Earth. Except that in exchange for saving human-kind, the Oankali want to change it forever. Butler excels at using the possibilities of science fiction to create a poignant commentary on issues of race, gender, and power in both modern and historical societies. This book provides a fascinating look at how humans exist, interact, and develop societies, as well as how behaviors can change when one is faced with challenges as an individual versus when the challenge is presented to a larger group. I have to say that I really enjoyed reading this book. There isn’t much to discuss in terms of plot (one can only go so far when being held captive on a spaceship), so much of the book was Lilith thinking about things and assessing her situation. Although I found Lilith to be a compelling character, my one complaint is that the rest of the human cast felt much more stereotypical and not as as well-rounded. Granted, we didn’t get any points of view from their perspective, so we can’t know everything they were thinking, but for the most part everyone did the things that the reader could have predicted that they would do. Which does make them consistent, but it also makes them boring. I feel as though this book gives the reader enough closure that they don’t need to read the other books in the trilogy, however, I also think this book is good enough that the other stories should be given a chance and I plan to read them sometime in the future. Actually, this book was good enough that I want to find even more of Butler’s works. She is a fantastic writer and I really need to read more of her stories. Octavia Butler is one of my favorite writers! I’ve really been enjoying your blog, btw.